In England, where I currently live, there are many ornamental gardens and very few Vietnamese people, which is one reason I was glad to meet the poet Ocean Vuong in Milan. It was July 3rd, and Vuong was in town giving a series of readings as part of La Milanesiana festival on the occasion of the translation of last year’s Night Sky with Exit Wounds into Cielo notturno con fori d’uscita. At the first of his readings at Palazzo Reale, copies of the Italian edition of Vuong’s book were stacked on a table by the entrance. The original cover—a photograph of a young Vuong between his aunt and mother—had been redesigned in the comparatively modest style of Continental publishing. Here, they appeared as if in a Victorian locket, inset in miniature on a backdrop of bluish-gray. In real life, Vuong materialized for our conversation full-size in a floral shirt. He speaks softly and steadily in an unmistakable voice, American-accented English and southern dialect Vietnamese. 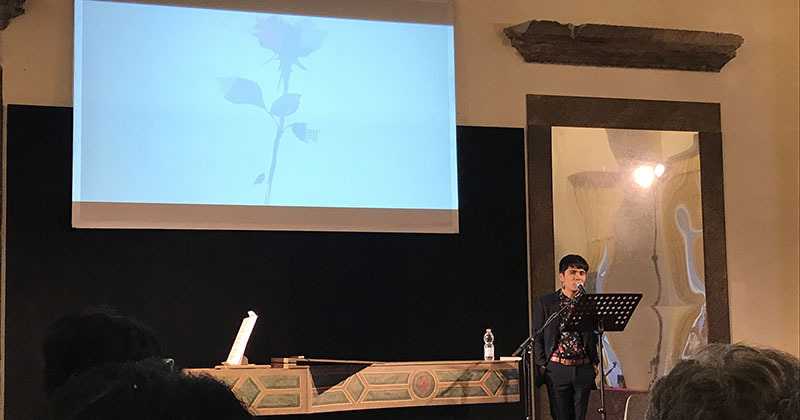 Ocean Vuong reading at La Milanesiana. Photo by Yen Pham. In some ways, it’s very easy to write about Ocean. If you have read about him before, you may know that his family left Vietnam in 1990 when he was two, that the seven of them shared a one-bedroom apartment in Hartford, Connecticut. 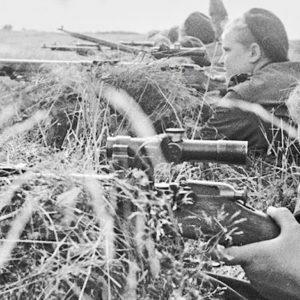 That he was born under the sign of one of life’s typical ambivalent calculuses, as he documented memorably in the poem “Notebook Fragments”: “An American soldier fucked a Vietnamese farmgirl. Thus my mother exists. Thus I exist. Thus no bombs = no family = no me,” followed aphoristically after the line break by— “Yikes.” That he otherwise descends from a line of illiterate rice farmers, and that he was the first in his family to learn to read proficiently, at age 11 and with great difficulty that was exacerbated by what he later discovered was a family history of dyslexia. Vuong’s poetry is energetically recombinant of all the forms, questions, and events—public and private, past and present—that have forged him. Night Sky is a writing into being, the production of a personal mythology from the brink of disappearance. It is mythological and consequently ritualistic, beginning by the crossing of a “Threshold” and ending with a “Devotion.” To arrive at the present it reaches first into the past. A man and a woman make love during the fall of Saigon, as the city resounds with Irving Berlin’s “White Christmas.” “Immigrant Haibun,” Vuong tells me, depicts his parents immigrating in a wine bottle. But if the collection exhibits a rough chronology, from origins that precede existence to young adulthood and tentative, then assured explorations of queer sexuality, it is not to suggest that time is either tight or linear. Vuong’s point is precisely that war does not end simply because forces withdraw and the dead are buried. It persists in memory, in PTSD, even in inheritance, symbolized by the monarch butterflies of “My Father Writes from Prison” and Vuong’s recent New Yorker piece, addressed to his mother. Vuong never expected to make a living as a poet—he lasted three weeks in a marketing degree at Pace University—but he “just did it until I was so deep into it that I realized, wait, it is what I’m doing.” He is currently working on his first novel. Perhaps, he says, he is speaking “out of naiveté of youth,” but for now, in everything that has failed, he has also found something to salvage. Vuong admits that some days he does “feel hopeless,” but that he is “smart enough now” to know he has to wait out, because acting on hopelessness only leads to self-destruction. “I think that no matter how difficult it is we have a choice of what we hold for ourselves,” he says, an approach that for Vuong lends itself to the day-to-day as well as it does to one’s approach to “the complicated, violent Western canon” or national holidays of independence. July 4th, he tells me, always reminds him of Frederick Douglass’ famous 1841 speech about the value of that celebration to the enslaved. At different times, including this one, the trail of our conversation has looped back to the idea of monuments, and Vuong’s hesitation around cultural restoration that effaces histories of violence. “If we allow ourselves to look at July 4th as a monument, and if a monument invites redefinition, then for me it’s not necessarily a blind celebration, but an interrogation.” He points out that fireworks are known to trigger some veterans with PTSD, and that they, like fighter jet displays, are “extremely militaristic.” “What does it mean when we talk about peace, when we talk about the safety of black bodies, of POC bodies, of trans bodies? When we celebrate our country with the spectacle of destruction, what does it mean?” he asks. Yen Pham is a writer and journalist currently based in Oxford, where she is studying on the Rhodes Scholarship. Her work can be found here.